While in Durand, Michigan to witness the Southern Pacific 4449 passing through, we stopped for dinner at a local place called "Nick's Hometown Grill." Of course we brought our cameras to the table, wisely not snapping while anyone was eating. 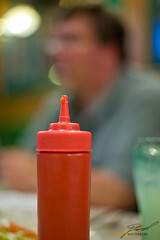 The shot of DNO_Dennis across the ketchup bottle. joseph645 was even kind enough to give the bottle a little squeeze to create a nice little blob oozing from the top.